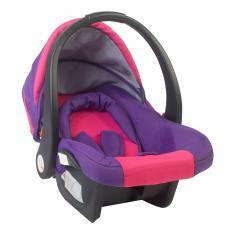 Some infant car seats are convertible, meaning they can be used after the child outgrows the infant stage. When looking to purchase a 3-in-1 car seat, a number of factors should be taken into consideration. Finding the best seat is a matter of evaluating your car seat needs, determining the amount you want to spend and then considering aesthetic factors, like color, design, and extra features. Other important considerations include ease of installation and use of the harness, and comfort for your infant or child. Although the initial cost for a 3-in-1 car seat is more than for other types of car seats, it is the only car seat your child will need. It is designed to meet your child's car seat needs from birth until he or she no longer needs a car seat at all and replaces three separate car seats. Prices vary depending on the model, manufacturer, and style, but in 2011, these seats can cost up to $300 US Dollars. One of the most important things to consider when choosing a 3-in-1 car seat is whether it is easy it is to use. When an infant is being placed in a rear facing seat, the harness needs to be easily accessible so that it can be buckled and so that any necessary adjustments to the straps can be made. The harness adjustments are not always located in a convenient place when the seat is in the rear facing position. Look for a model with an easy-to-reach harness adjustment. You will most likely be looking at 3-in-1 car seats when your child is an infant. In addition to making decisions based on the use of the seat for an infant, think about using the seat when your infant becomes a toddler and a pre-schooler. Choose a seat that will grow with your child and your needs. Features like cup holders or the type of booster seat that the 3-in-1 seat converts to may not be pertinent now, but they will be in the future. Car seats are available in many styles. If you prefer a neutral color, there are models available in greys and browns. Styles for baby boys include shades of blue, red as well as camouflage patterns, while seats for girls are covered in pinks, pastels, and animal prints. The durability of the seat and the seat cover should also be considered. Since your child will be riding in a 3-in-1 car seat for several years, make sure the entire seat is durable and will not show signs of wear. Many online sites that sell baby travel gear include consumer reviews or opinions on products. Some sites also allow consumers to rate the products. Although you shouldn't base your purchase entirely on other consumers' opinions, it can be helpful to see what other parents say about specific models of the 3-in-1 car seat you may be considering. Asking other parents, such as neighbors, friends or relatives, is another way to find out the pros and cons of different seats. How Do I Choose the Best Travel Booster Seat?